Verdict: Perhaps the best Malaysian Chinese movie I’ve ever seen. It literally offers tears and laughters. The acting of the cast are very natural and usually when it comes to local films, that alone is enough to impress me. The little girl who plays Sze Xin (sorry, I’m not sure what her real name is) melted my heart with her performance. The story of the movie explores many different but related themes; like filiality, family relationship, generation gap, simplicity in life that could be sufficient for happiness, unforeseen changes and circumstances in life, the mindset of the older generation, problems faced by senior citizens, and many more. It’s truely a Great Film to watch but it’s meant only for locals who could relate. Least favourite scene: One of the rather peculiar scenes at the beginning where it’s like an Astro advertisement. It was obviously written solely to promote the products of the film’s sponsor. Racism? There are couple of jokes about Indians which I didn’t find it that funny and it wasn’t really necessary although it’s a part of our Malaysian culture. If there were jokes about Malays, this film would’ve been banned from domestic release. 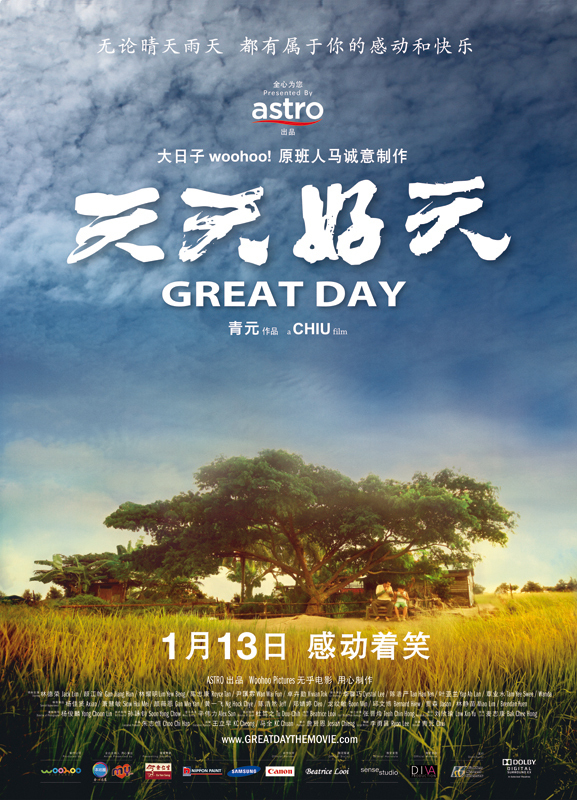 Synopsis: Great Day tells the story of two Uncles who live in an old folks home. Aggravated by an argument, the two men decided to escape from the old folks home to find their children just to show off whose children is better with the help of Ah Hock and Ultraman. The fun catches in with odd circumstances, but in the end of the day it’s going to be a big reunion at the old folk’s home. i want to watch this soon, i heard that it's very touching!! Not able to celebrate cny with him anymore.